Since the beginning of this week, the USD/CAD pair has grown by more than 250 points due to a decrease in demand for CAD and a moderate growth of USD. The price easily broke the local maximum of the end of June at 1.3390, which was a strong resistance level. CAD is under pressure of a rapid decline in oil prices and a drop in the activity of the energy sector. The US dollar, in turn, gradually strengthens its position. Today and tomorrow, in the United States a number of key releases that may affect the pair, will be released: labor market data, including Nonfarm Payrolls, statistics on Production Orders, as well as key indices. In the short term, the upward momentum will raise the instrument to key resistance levels. If the US releases on the labor market are positive, the price may grow significantly. 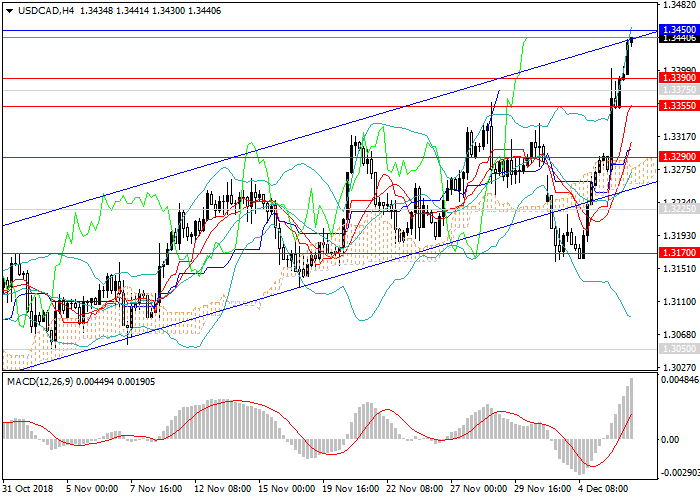 Now, the pair has almost reached the next serious resistance at the level of 1.3450. From this level, the pair may drop and move under the influence of trading sentiment and macroeconomic statistics. The long-term and medium-term trends remain upward, which means it is worth opening long positions, perhaps just after the downward correction. Technical indicators confirm the growth forecast, the volumes of long MACD positions are growing, Bollinger bands are directed upwards. The Resistance levels are 1.3450, 1.3530, 1.3570, 1.3595, 1.3610, 1.3650. Support levels: 1.3390, 1.3375, 1.3355, 1.3290, 1.3225, 1.3170. It is relevant to open pending long positions from the levels of 1.3375, 1.3355, 1.3290 with the target at 1.3530 and stop loss 1.3240.